The tutorial explains the vector and array forms of the Excel LOOKUP function and demonstrates typical and non-trivial uses of LOOKUP in Excel with formula examples. One of the most frequent questions that every Excel user asks once in a while is this: "How do I look up a value on one sheet and pull a matching value to another sheet?". Of course, there can be many variations of the basic scenario: you may be looking for the closest match rather than exact match, you may want to search vertically in a column or horizontally in a row, evaluate one or multiple criteria, etc. However, the essence is the same - you need to know how to look up in Excel. Microsoft Excel provides a handful of different ways to do lookup. To begin with, let's learn a function that is designed to handle the simplest cases of vertical and horizontal lookup. As you can easily guess, I am talking about the LOOKUP function. At the most basic level, the LOOKUP function in Excel searches a value in one column or row and returns a matching value from the same position in another column or row. 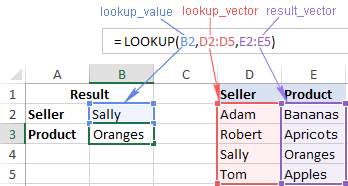 There are two forms of LOOKUP in Excel: Vector and Array. Each form is explained individually below. In this context, a vector refers to a one-column or one-row range. Consequently, you use the vector form of LOOKUP to search one row or one column of data for a specified value, and pull a value from the same position in another row or column. Lookup_value(required) - a value to search for. It can be a number, text, logical value of TRUE or FALSE, or a reference to a cell containing the lookup value. Lookup_vector(required) - one-row or one-column range to be searched. It must be sorted in ascending order. Result_vector(optional) - one-row or one-column range from which you want to return the result - a value in the same position as the lookup value. Result_vector must be the same size as lookup_range. If omitted, the result is returned from lookup_vector. The following examples demonstrate two simple Lookup formulas in action. In the second part of this tutorial, you will find a few more Excel Lookup examples that solve more complex tasks. In the meantime, please remember the following simple facts that will help you bypass possible pitfalls and prevent common errors. Values in lookup_vector should be sorted in ascending order, i.e. from largest to smallest or from A to Z, otherwise your Excel Lookup formula may return an error or incorrect result. If you need to do lookup on unsorted data, then use either INDEX MATCH or OFFSET MATCH. Lookup_vector and result_vector must be a one-row or one-column range of the same size. The LOOKUP function in Excel is case-insensitive, it does not differentiate uppercase and lowercase text. Excel LOOKUP works based on approximate match. More precisely, a Lookup formula searches for exact match first. If it cannot find the lookup value exactly, it looks up the next smallest value, i.e. the largest value in lookup_vector that is less than or equal to lookup_value. For example, if your lookup value is "5", the formula will search it first. If "5" is not found, it will search "4". If "4" is not found, it will search "3", and so on. If lookup_value is smaller than the smallest value in lookup_vector, Excel LOOKUP returns the #N/A error. The array form of the LOOKUP function searches the specified value in the first column or row of the array and retrieves a value from the same position in the last column or row of the array. Lookup_value - a value to search for in an array. Array - a range of cells where you want to search for the lookup value. The values in the first column or row of the array (depending on whether you do V-lookup or H-lookup) must be sorted in ascending order. Uppercase and lowercase characters are deemed equivalent. Note. The array form of the Excel LOOKUP function should not be confused with Excel array formulas. Although it operates on arrays, LOOKUP is still a regular formula, which is completed in the usual way by pressing the Enter key. If array has more rows than columns or the same number of columns and rows, a Lookup formula searches in the first column (horizontal lookup). If array has more columns than rows, Excel LOOKUP searches in the first row (vertical lookup). If a formula can't find the lookup value, it uses the largest value in the array that is less than or equal to lookup_value. If the lookup value is smaller than the smallest value in the first column or row of the array (depending on the array dimensions), a Lookup formula returns the #N/A error. Important note! The functionality of the Excel LOOKUP array form is limited and we don't recommend using it. Instead, you can use the VLOOKUP or HLOOKUP function, which are the improved versions to do vertical and horizontal lookup, respectively. Although there exist more powerful functions to look up and match in Excel (which is the subject of our next tutorial), LOOKUP comes in handy in many situations, and the following examples demonstrate a couple of non-trivial uses. Please note, all of the below formulas use the vector form of Excel LOOKUP. In the lookup_value argument, you supply 2 or any other number greater than 1 (in a moment, you will understand why). Now, how it comes that the formula returns the last non-empty value in a column, given that lookup_value does not match any element of lookup_vector? The key to understanding the logic is that Excel LOOKUP searches with approximate match, i.e. when the exact lookup value is not found, it matches the next biggest value in lookup_vector that is smaller than lookup_value. In our case, lookup_value is 2 and the largest value in lookup_vector is 1, so LOOKUP matches the last 1 in the array, which is the last non-empty cell! In the result_vector argument, you reference the column from which you want to return a value, and your Lookup formula will fetch the value in the same position as the lookup value. In fact, this formula is nothing else but a slight modification of the previous formula, with the only difference that you use the row reference instead of the column reference. With just a little creativity, the above formula can easily be customized for solving other similar tasks. For instance, it can be used to get a value associated with the last instance of a specific value in a row. This may sound a bit obscure, but the following example will make things easier to understand. Assuming you have a summary table where column A contains the seller names and subsequent columns contain data of some kind for each month. In this example, a cell contain "yes" if a given seller has closed at least one deal in a given month. Our goal is to get a month associated with the last "yes" entry in a row. The formula's logic is basically the same as described in the first example. The difference is that you use the "equal to" operator ("=") instead of "not equal to" ("<>") and operate on rows instead of columns. In all of the Lookup formulas we've discussed so far, the lookup_vector and result_vector arguments were represented by range references. However, the syntax of the Excel LOOKUP function allows supplying the vectors in the form of a vertical array constant, which enables you to replicate the functionality of nested IF with a more compact and easy-to-read formula. Note. For an Excel Lookup formula to work correctly, the values in lookup_array should be sorted from A to Z or from smallest to largest. If you are pulling values from a lookup table, then you can embed a Vlookup function in the lookup_value argument to retrieve a match. Tip. If you are using Excel 2016 as part of an Office 365 subscription, you can use the SWITCH function for similar purposes. I hope these examples have shed some light on how the LOOKUP function works. To better understand the formulas, you are welcome to download these Excel Lookup examples. In the next tutorial, we will discuss a few other ways to do lookup in Excel and explain which Lookup formula is best to be used in which situation. I thank you for reading and hope to see you on our blog next week! Merge Tables Wizard - formula-free way to look up and match in Excel. 29 Responses to "Excel LOOKUP function with formula examples"
Please check out this section of How to remove duplicates in Excel tutorial. If those formulas are not suited for your task, then look at How to identify duplicates in Excel. Svetlana, the formula for the horizontal lookup needs fixed. It is the same as the vertical formula. The screen capture has it typed correctly. Thanks again for these helpful posts. I learn something new every time I visit! Good catch, thank you! Fixed. And thank you for your kind words about our blog! Can we use multiple if conditions, in the above mentioned formula? I mean in lieu of checking the status column, want to check all the three columns by using if conditions. If the criteria in the column 1 is correct means,it has go to column 2 and should check and if the column 2 is also correct means it has go to the column 3 should display the results like Development, testing and completed. I believe you can use an IF formula with an embedded AND statement(s) like in these examples. If you are trying to achieve something different, please give me some more details about your task and we will try to work out a proper formula. I tried. But, i got answers for all the conditions. I want only one answer either it should be any one of the answers or else should be false. I am preparing the accounts of the non-profit organization i.e,it is a council. Their main activity is issuing new licence to engineers or renewal. But, there are 4 types of company they are handling 1.contractor 2.foreign branches 3.joint venture and 4.local engineers. Above all, types of engineers is 4, viz Category A,B,C & D. It is applicable to all types of above mentioned companies. For each type of company, registration and renewal there are some item codes available. I want to bring that item codes in the last column. My columns details are 1.purpose - registration or renewal 2.type of company - contractor,foreign brach,joint venture & local engineer 3.engineer type - A,B,C & D.
could you, please, send us the workbook with the data you used and the results you got at support@ablebits.com? It's hard to get a clear understanding from the comment, since the data is in a mess here. in each grouping before the final parenthesis to avoid the "FALSE" output. Instead mentioning contractor,foreign branch,local branch i mentioned only c or b or f in column B..
Hi, Svetlana, thanks for your post. I have learnt about the function of Lookup. Thank you. Thanks for your reply. Its really worked out. But, still not perfect. But, helped lot. My fix was backwards. I avoided a negative result for the first check only. I think if the ,"" goes before the six parentheses it avoids the FALSE outputs. so instead of ))))),""), it should be ,")))))) at the end of each IF grouping. Have you considered concatenating your columns E,F,G into one string, and using that string to refer to a helper table? Finally i solved it through index and match formula in a fraction of seconds. Thanks to the ablebits website. Hi Svetlana, I have a question, I could not solve this problem, So I need your help. I am working a private compny of HR Department. My problem is- 1-I have some STAFF OT data from 2014(january to December) to till year in sheet-1. 2- I have some Operator OT data from 2014 (January to December)to till year in sheet-2. D2- February like this upto December. If I will choose any category (Staff , Operator and Labour)with they're year then enter any Employee code number, automatically show that employee name and january to december OT data which category I had choosen with year. In cell C24, enter a lookup function that looks up the value of cell B24, from the range named SurveyRange to supply a category letter in cell C24 based on the value in B24. The result should be an exact match. Use an appropriate mixed reference for the lookup value so the formula can be copied to cell D24. I've tried both HLookup, and VLookup. I've also tried other functions with no avail. Kindly, suggest me with a formula to list all the data from Format 1. to Format 2. But I get an unspecified error message. Can you please explain. Thanks in advance. I have a spreadsheet and the value can be entered in any order in the rows which depends on calculated condition. My column remains same but row changes for these calculated values. I want to number the rows or find the rows in the order that it gets calculated. So for example row 1 might be calculated first, that should return me 1. Then may be row 3 gets populated so it should return 2. Then may be row gets calulated that should return 3. Is there a way to get this using formulas, if not using script which should calculate with out manual intervention. I have a spreadsheet and the value can be entered in any order in the rows which depends on calculated condition. My column remains same but row changes for these calculated values. I want to number the rows or find the rows in the order that it gets calculated. So for example row 1 might be calculated first, that should return me 1. Then may be row 3 gets populated so it should return 2. Then may be row 2 gets calulated that should return 3. Is there a way to get this using formulas, if not using script which should calculate with out manual intervention. i don't understand the use of Look_up Value, which you have filled as 2. Can it be any number or it has to be 2 only. hello friends pls help me with formula for below calculation..
i have text in different column and i want last text value with criteria..